The steps to enrol are the same for each study period. You must choose your subjects, check your timetable, and then enrol online. Online enrolment closes at the end of Week 1 of the Study Period. After this date you need to contact your Divisional Enrolment Team if you want to change your enrolment. Use your Study Plan in eStudent as a guide when choosing your subjects – it gives you a blueprint of what subjects you need to do in order to complete your degree. Most degrees will have a combination of both core and elective subjects. If your degree allows for you to choose an elective subject, you can browse all JCU subjects on Subject Search. If you need help, visit the Course and Subject Handbook for a breakdown of your course and its subjects. Alternatively, you can refer to our first year course enrolment planner guides or contact your Divisional Enrolment Team for advice. Once you've chosen your subjects, start to plan your class timetable by downloading a timetable planner (PDF, 50 KB) and checking the published class timetable online. Tutorials and workshops are usually repeated and you only need to choose one time, however it's a good idea to write down several options. Select Subjects on the left side of the screen. Select your College, or other as appropriate, from the top drop down box. Choose your subjects from the top drop-down box. Select more than one subject by holding down the Control (CTRL) key on your keyboard while you make your selections. Select the study period or weeks from the next drop-down box. Finally, choose the days and times from the next two drop-downs. The best option, unless there are intensives or weekend activities, is to choose all week and all hours. Write down the subject classes in your timetable planner. For help on using your timetable, look at our Timetable Help guide (PDF, 1503 KB). Build your personalised class timetable in eStudent once you've enrolled in your subjects – see Step 4. Go to the My Study Plans tab, then on the side menu select Study Plans to select your course. Subjects that you can enrol in are highlighted on your plan. Once you have enrolled, check your enrolment is correct by selecting Current Enrolment. Take this opportunity to check your personal details in eStudent. Visit My Details and confirm your personal information is correct, including your semester residential address and your contact details. Once you’ve enrolled in your subjects, you'll also use eStudent to register in classes and produce a personalised class timetable. All dates and times for opening class registrations will be staggered according to study periods and Colleges. Check your JCU email for notifications about opening times for class registration for your Study Period and year level. Select the My Timetable tab in eStudent. The subjects you have enrolled in will be displayed, along with their class registration status. For classes with no choice (e.g. a single lecture that everyone should attend), you’ll automatically be registered into that class. Red circle – you are not yet registered for any classes for that subject. Yellow circle – you have registered for some but not all classes. Green circle – you have registered in all classes for that subject. For subjects with multiple classes available (e.g. tutorials), you’ll need to select your preferred class. Use the Register or Change option to manually register into classes. Select the class you want (make sure a green plus symbol appears) then select Save. Repeat until the registration status for all subjects display the all classes registered message. If there are no places left in the class options and a wait list is available (indicated by a grey clock), you can opt to be placed on the wait list for that class. You will be contacted to confirm your place. If there is no wait list available, you should select an alternate class, or you may need to change your enrolment. If you withdraw from a subject, eStudent will automatically de-register you for any classes for that subject. 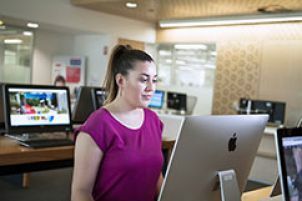 For help, see eStudent online help. Go to Ask Us – there are more than 1,000 commonly asked questions and answers available 24/7. What if I need help using eStudent? Do I receive any printouts as confirmation of my enrolment? How do I withdraw from a subject (domestic students)? What is the difference between enrolling in subjects and registering for classes?